Lovely! Even in a drab soot-filled city, children play. They're the only color, in their magic circle. I've come to look at your work over the last several weeks and it always makes my heart full of happiness and joy! Thank you so much for your kind message and I'm hoping to be back soon contributing to I.F. But, I wanted to let you know that I've been here, even, when I don't leave a message and as usual, it's a lovely blessings! NOW THIS IS STELLAR!!!!! OH MY GOODNESS GRACIOUS!!! It's so very beautiful and filled with such fun and whimsy!!! I LOVE IT! and I do mean LOVE IT!!! Awesome work Kathy!! Wonderful Kathy! Such a good idea and so beautifully rendered! I love the way you've coloured the group of children and added the flower petals. Just magical! I just love your illos! They are just beautiful! Very beautiful. I love the contrast between the happy, colourful children and the bleak buildings. (Btw, I love the way you've drawn the houses). Beautiful illustration! I just love that the kids are the only thing really in colour! Very well done! Beautiful, They are so happy and giving sunshine through the grey houses. Stunning! Always, always love your work! You're one of my favorite illustrators...love the parade also. Love the slightly sinister sepia buildings and the contrast with the cheery children. This is so charming. I love all the textures and fine details. Thanks for sharing. what is the size of your drawings?do you draw in big paper? Penny, I usually work at about A3 size.. The contrast in colors is amazing Kathy! Truly beautiful! I am in awe of your talent! Kathy, Kathy, Kathy....You continue to enchant me with your wonderful work! Another masterpiece!! great movement and feeling! A very lovely rendering of a not so bright topic. I really like the way you used black and white and color to show how the song has progressed. fantastic illo, once again. your art is so inspiring to me. 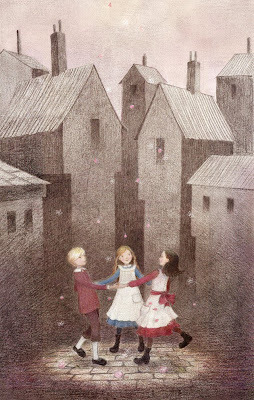 Your illustrations are beautifully enchanting! The color palette works very well with the illustration. Great job, Kathy! This is just lovely! Great texture. Could you BE any more talented? This is just jaw-droppingly wonderful. Wow! Great ambience created with the colours...very inspiring. 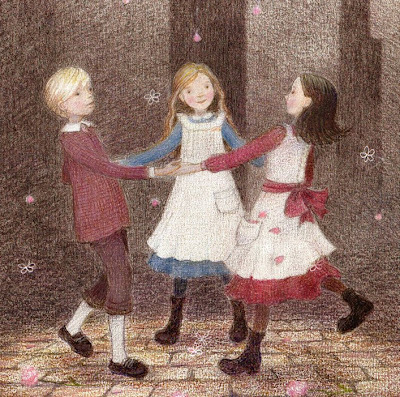 I feel like i just stepped into another time, another place, a friendlier time where children were still children. Beautiful artwork, with a very classical feel! I want to take time to discover all your sketches... can i add you to my links ?